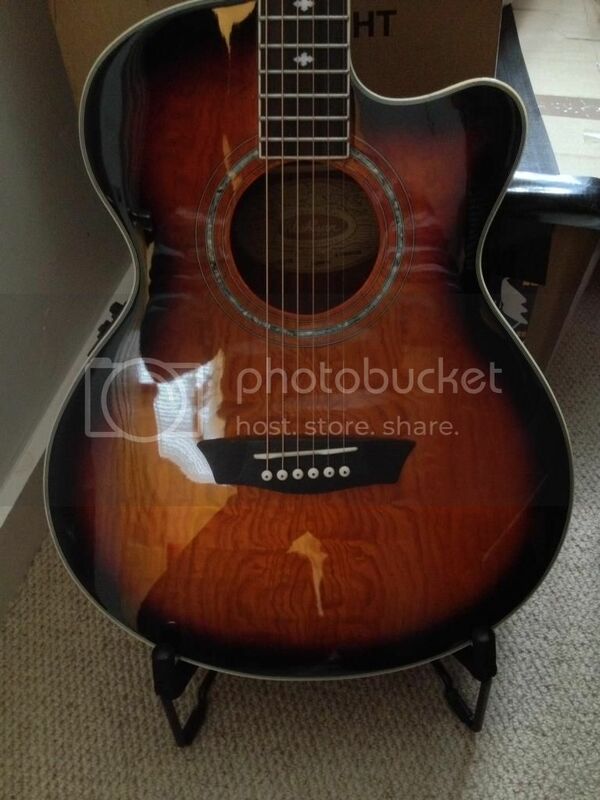 I just bought a Washburn ea180TS, brand new, from my local guitar shop (249 pounds, January 2015 in the UK). Searching the internet I cannot find any mention of this model , except for the webpage of the shop I bought it from and one other online shop. Is it a Washburn at all , or did I just buy a fake? 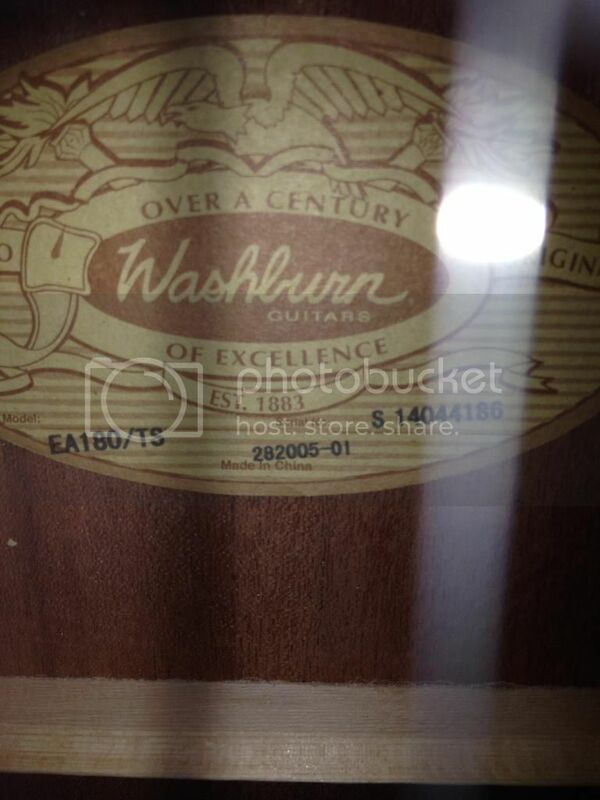 The label inside the guitar says the model is EA180/TS and the serial number is S14044186. There is another number also - 282005-01. I've been through the Washburn catalogs online and the nearest model I can find is the EA18 ATS, in the 2005 catalog. My guitar looks very similar, but the woods used and electrics are different. Re: Why can't i find any info on my EA180 TS ? 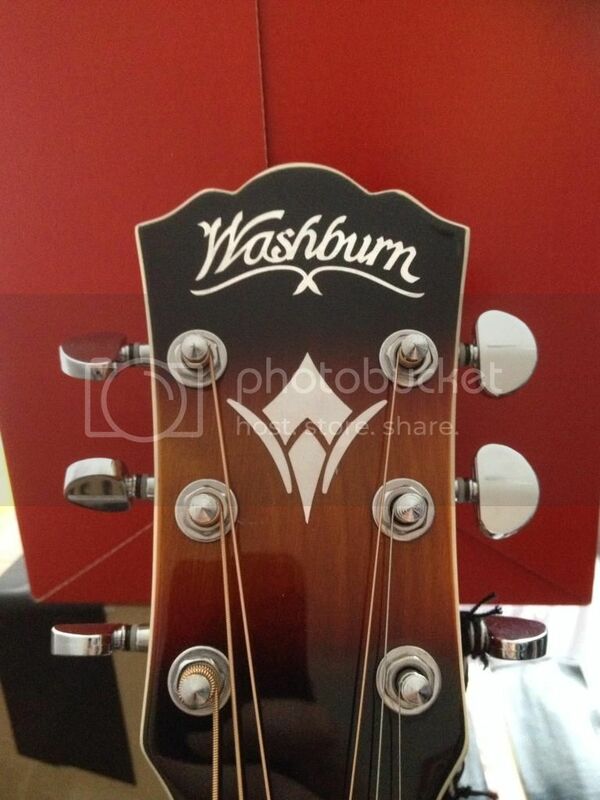 I emailed washburn and they replied almost immediately to say it was a UK only model. I had tried to respond by phone and could not...but was going to say that the label looks authentic to me. Place of origin was probably Samick, China (that's the "S" in the serial number)...serial numbers are a bit difficult to decipher regarding date of manufacture, but it's most likely either a 2011 model or a 2014 model. Is that damage to the finish on the soundboard I see, or is it just the way the lighting is (that looks like it)? Of course, you've probably figured out by now that the TS in the model designation means "Tobacco Sunburst", the finish on the soundboard. Very nice looking model and the EA series is highly regarded around here...rather "thin" sounding when played strictly acoustically, but very well regarded when played plugged in. It is probably an all-laminate model, which is not a bad thing for an A/E model...most of the time the nature of the sound produced is related more to the electronics than to the manner of construction. Enjoy it and let us know how you like it, please. The wood used is koa and as you say, presumably a laminate at this price point. Electrics are Fishman 301T. As far as I can tell neither koa nor the Fishman electrics are used on any other washburns, which is one reason I doubted the authenticity. The fingerboard is rosewood. I tried a lot of sub Â£500 guitars in the shop and frankly I couldn't hear a lot off difference between them. I have smallish hands and chose this guitar as it felt the right size and easy to play. It was also the coolest looking guitar I tried, which is obviously vitally important. Why it is only available in the uk and why it's made from different materials from other EA's that look the same is a mystery. Maybe it's an experiment, who knows.